device-specific integrity mechanisms, thereby providing additional defense-in-depth. Titan is a tiny security co-processing chip used for encryption, authentication of hardware, authentication of services. 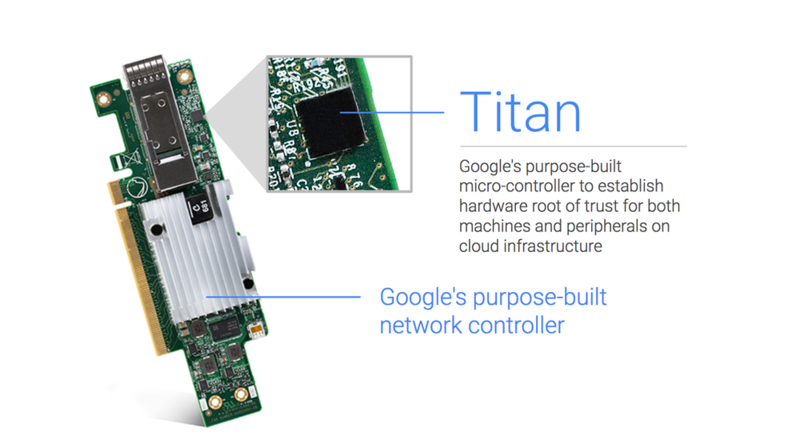 Every piece of hardware in google’s infrastructure can be individually identified and cryptographically verified, and any service using it mutually authenticates to that hardware. This includes servers, networking cards, switches: everything. The Titan chip is one of the ways to accomplish that. The chip certifies that hardware is in a trusted good state. If this verification fails, the hardware will not boot, and will be replaced. Every time a new bios is pushed, Titan checks that the code is authentic Google code before allowing it to be installed. It then checks each time that code is booted that it is authentic, before allowing boot to continue. Suggestions that it plays important role in hardware level data encryption, key management systems, etc. Each chip is fused with a unique identifier. Done sequentially, so can verify it’s part of inventory sequence. Three main functions: RNG, crypto engine, and monotonic counter. First two are self-explanatory. Monotonic counter to protect against replay attacks, and make logs tamper evident. Sits between ROM and RAM, to provide signature valididation of the first 8KB of BIOS on installation and boot up. Produced entirely within google. Design and process to ensure provenance. Have used other vendor’s security coprocessors in the past, but want to ensure they understand/know the whole truth. Google folks unaware of any other cloud that uses TPMs, etc to verify every piece of hardware and software running on it. Google recently launched GPUs on Google Cloud Platform (GCP), which will allow customers to leverage this hardware for highly parallel workloads. These GPUs are connected to our cloud machines via a variety of PCIe switches, and that required us to have a deep understanding of PCIe security.